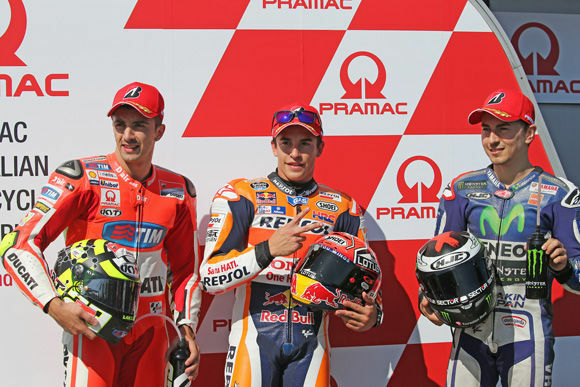 Marc Marquez (Honda) took pole at Phillip Island earlier today with a sizable gap over all the other riders. Lacking his beloved “edge treatment” tires this weekend, Yamaha’s Jorge Lorenzo had to settle for third quickest, slotting just behind Ducati’s Andrea Ianonne on the front row. Ianonne admitted to drafting Lorenzo during the qualifying session, which enabled his quick time. Lorenzo’s title rival (leading the points by 18 going into this weekend) and teammate Valentino Rossi qualified on the third row in seventh. Stay tuned for race results we will post this evening (US time). No spoilers ahead but if you haven’t watched a MotoGP race in a while, this is the one to watch. Hands down the best race I’ve seen in years. Spectacular battle at the front, don’t miss it!!! Marquez already promised if they were on the last lap he would give Jorge a wide berth so as not to interfere. 8 pm as I type and about 4 1/2 hours until it’s on the telly here. Going to be another late night. Rossi really needs to learn to qualify better lol. Of course this makes it even more interesting. Might be yelling at the TV soon. It just kills me, the way Rossi handicaps himself every race. Starting from where he does, he’s always two to three seconds down on the leaders before the first lap is even completed, at which point he can then only hope to win a race of attrition. Seriously, the way he keeps pulling this crap, dude is going to push me into rooting for Yo Quiero Taco Bell. well if he can pull this Championship off, I just won’t worry about him anymore. But this year it is driving me absolutely crazy. Yep, this particular season has taken on a bit of a Holy Grail radiance, courtesy of the GOAT’s tilting-at-windmills quest for championship #8. Two years ago, none of us saw this coming. We all thought his sun had set, and that’s what makes this run so sweet. Rossi has been the victor from8th. No worries. He has the race pace and loves this track. Not really worried about Ianonne, Crutchlow, or Vinales. Dani is the wildcard. He’s the one that could come between Jorge and Valentino. Including Marquez it will be the same four guys at the end, excluding crashes and other weirdness. It would be interesting to see Dani and Marc battle each other. Haven’t seen those two really square off much this season, and if Dani pushes Marquez who knows what might happen? As always, Rossi’s crap starting position means he has to avoid trouble during the first-lap scrum. So far this season he’s been able to avoid getting taken out, but those hectic first few corners at the beginning of any race are always dangerous for the guys caught in traffic. I have a prediction for you: this is just going to get more interesting!!! I want to be fan comment: coooooMMMEEEEE on (geeee 3rd row?) VR kick JL derrière! !